Snack Girl finds that most hot chocolate mixes are missing something important. They lack the most important flavor of all. Have you noticed how they taste like sugar and not chocolate? This is probably because sugar is a lot cheaper than chocolate. The first TWO ingredients in Swiss Miss Hot Cocoa mix are sugar and corn syrup. Swiss Miss does have milk in it so it is not vegan - and the fourth ingredient is cocoa. You have to take matters into your own hands and make your own hot chocolate with cocoa powder that you find in the baking section. I recently used this stuff in my secret ingredient chili. But, you don't have to make it full of calories and fat to have it be really tasty. I tried using unsweetened almond milk for my recipe, and it was surprisingly luxurious. Almond milk can be found in the dairy section of the supermarket and is made by mixing almond crumbs and water. I got hooked on the stuff after a reader told me about it. By mixing almond milk and cocoa, you have created a "chocolate nut" drink! Almonds and chocolate go together, right? So, mixing processed forms of them and drinking it is pretty healthy and delicious. This concoction does not taste like hot cocoa mix - and you may find you need more sugar to be satisfied with it. This hot chocolate is STRONG on chocolate. Mix it with a cinnamon stick to add a kick or how about a candy cane? 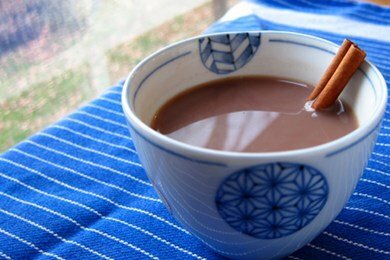 Have you made vegan hot chocolate? Heat almond milk in a microwave or on the stove until hot. Mix in cocoa powder and sugar - stir until dissolved -and enjoy! i love making my own hot coco! i made some yesterday with 1/2 tbsp dark chocolate coco powder (which is AMAZING!) a pcket of stevia and 3/4 cup almond milk. perfect for a wintery day! Almond Breeze also has a chocolate flavor out so if you like a really strong chocolate flavor,that seems to be a good idea to use. I bet if you used this with a shot or two of espresso added in it would be a great mocha. YUM!! Can't wait to try this. One resolution of mine is to try more vegan foods in the New Year. Can't wait to start with this one! YES, this is the only way to have Hot Cocoa!! My kids don't know anything about the packets. I love Almond Milk and so do my kiddos. As a child, we always made it from scratch (with low fat cows milk though) so I never knew any other way but scratch. The taste is amazing!!! Think I'll go share a cup with the Hubster before bed! I have been making this all month, supper yummy and easy to make! This is such a great easy healthy recipe Lisa, thanks. I do have one question though. Is there a substitute sweetener that true vegans would use in place of sugar? Just use any of the bone char free options. Thanks for your question! It is crazy-hot-degrees out today but I'm craving hot cocoa. Google led me to your awesome blog! This is so simple I practically cracked up! Okay, thankfully, I have all the ingredients at home already because I was on the verge of developing a nasty habit at work drinking Flavia's Dove hot chocolates since they installed a machine right in our office! Thank you - this is a MUCH better alternative!! So yummy! I love love love this. Blessed be. I used Maple syrup instead of sugar and it came out amazing. Rich wintery favors! Avoid carrageenan in the almond milk that you buy. I love this recipe so much! I was able to cut the sugar back to 1/2 tsp over time. FYI, when I first discovered almond milk I was drinking about a quart per day in cocoa, smoothies, etc. Unfortunately, for some reason it gave me really bad breath, so I had to cut back to a cup a day. I'm mentioning this in case anyone else drinks a lot of it. Thanks for this great cocoa alternative to those store bought packets. It's delicious either with sugar or stevia. I like some of the other things the commenters have tried.